Texte aus Indien s. am Ende des Beitrags! You're welcome to India, nukes are NOT! Please spread the word. 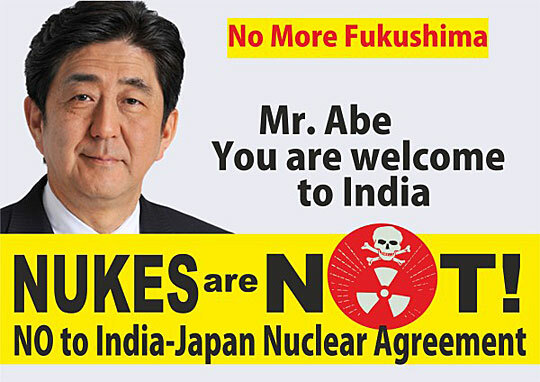 Oppose the absurdity of India-Japan nuclear agreement after Fukushima, when Mr. Shinzo Abe is not able to fix Fukushima and all reactors in Japan have been closed down. Mr. Shinzo Abe, Prime Minister of Japan is going to be India's chief guest for this year's Republic Day ceremony on 26th January. During visit from 24-26 January, the India-Japan nuclear agreement will also be finalised, which the two governments have been pushing for a long time. We support better relationship between India and Japan but find a nuclear agreement absurd and unacceptable after Fukushima. - It is ironical that Japan is selling nuclear technology to other countries while the crisis in Fukushima is further deepening. People evacuated have no hope of returning back and the dangerous leaks of radioactive water are continuing unabated. - The agreement will give a push to the Indian government's insane and anachronistic nuclear expansion drive which it is implementing through brutal repression of its rural poor. A recent global nuclear safety report has ranked India 23rd last among the 25 countries. The nuclear regular in India is completely toothless and non-independent, as highlighted by the CAG report last year. In Gangjeong auf Jeju-do in Südkorea wird mitten im Naturschutzgebiet ein moderne Kriegshafen gebaut. Die südkoreanische Regierung läßt ihn durch di Fa. Samsung und in Anbsprache mnit der US-Regierung bauen. Die Proteste dauern nun schon 7 Jahre, die Firma und die Polizei greifen immer wieder zu gewaltsamen Methoden, um den friedlichen Protest zu unterdrücken. Epiphanias ist ein herrliches Fest! Wir feiern die Erkenntnis, dass Gott in jenem Kind sichtbar wird. Während bei uns im Westen schon alles wieder in den Startlöchern sitzt, um nach den schönen Feiertagen in den Alltag zu springen – oder gar schon wieder von diesem Alltag eingeholt ist – feiern Christen im Osten, im „Morgenland“, heute Weihnachten. Es ist gut, wenn wir in der Ökumene diesen Tag ganz bewusst und selbstverständlich als einen der Weihnachtsfeiertage nutzen, um erst von hier aus wieder in unseren Alltag aufzubrechen. Schließlich kamen an diesem Tag jene weisen Wissenschaftler aus dem Morgenland, um zu verifizieren, was sie in ihren theoretischen Berechnungen herausgefunden hatten: einen „neugeborenen König der Juden“ müsste es jetzt geben – so haben wir es gerade in der Lesung aus dem Matthäusevangelium gehört (Mt 2:1-12). Die Forscher aus dem Morgenland setzen sich in Bewegung, suchen. Wer Erkenntnis sucht, kann nicht bleiben wo er ist. Neues gibt es nur für jene, die sich auf den Weg machen, die auf-brechen. Dabei ist das Ziel noch nicht einmal klar: sucht man den „König der Juden“, geht man selbstverständlich zunächst einmal in das entsprechende politische wie religiöse Machtzentrum: Jerusalem! Und natürlich erschrickt der Machthaber Herodes über solche Nachrichten: ein Konkurrent? Einer, der die eigene Macht in Frage stellen wird? Einer, der gefährlich werden könnte für die herrschende Klasse? Er selbst hat ja kluge Theologen um sich versammelt – „Hohepriester und Schriftgelehrte“. Gern halten sie sich in der Nähe der politischen Macht, um sie für ihre Zwecke zu nutzen. Und sie verstehen: was die fremden Forscher aus dem Osten suchen, wird nicht hier, im Zentrum zu finden sein. Es wird sich wohl um eine Wahrheit handeln, die eher am Rande der Gesellschaft geboren wird. Bei den Marginalisierten. Betlehem in Judäa kommt in Frage. Sie kennen ihre Bibel. Der Prophet Micha hatte es einst so angekündigt (Mi 5:1). I beg you to read my rough sentences on the present crisis in Kwang-ju City. I am afraid you foreign reporters did miss the key scenes of the tragedy in our city. Are you reporting on us so vividly as on the situation such as in EL Salvador, Uganda, etc? I am a female citizen of Kwang-ju City. Graduating from the S.N.U several years ago, I have been lecturing English at an institute these years. With this career, I am determined to run the risk that the martial law authorities may identify and arrest me. But please regard my safety. First of all, I' d like to stress that none of my family have ever been harmed by the late President Park' s regime and his successor' s. Thus, believe in the truth and objectivity of my words , please. I am convinced you cannot help but believe me if it were for the so-called telepathy, the interworking of human hearts, although 1 cannot offer no material evidence here. Please believe in this letter to the letter! The brutal deeds of the air paratroopers during May 18th, 19th, 20th were far greater than the authorities enumerate only to deny. On the morning of 19th, my father (professor) witnessed some of them to throw the wounded down to death from a two-story roof top in Chung-jang Street. At about same time, near Jo-hung Bank, my mother witnessed that a young demonstrator was battered on the head with the bat, with his cerebral tissue exposed. And these were the rather mild cases among their cruel actions. 1 wonder if any one had the courage to take the picture of the cruel scenes, as the atmosphere was so deathly. As they were so inhumanly brutal during the three days. We know no other way to interpret their deeds except that they had been on purpose brain-washed for a considerable time and starved for a few days, given only alcohol beverage and hallucinating medicine. 1 guess that the comments of elders, "There were no such cruelties as these even during the war in 1950." stirred the public sentiment deeply. We believe that the 'vampire units' (the paratroopers are now passing as the title) hid or burned away a lot of the dead bodies they killed. The Asia-Pacific Journal, Vol. 11, Issue 16, April 22, 2013. If one considers the tremendous task remaining to be done in Fukushima Daiichi (such as the removal of the thousands of spent fuel rods) to avoid an apocalyptic scenario for Japan and the northern hemisphere,2 the workers employed at Fukushima Daiichi merit world attention and support. Their living and working conditions are indeed apocalyptic. Paul Jobin is Director, French Center for Research on Contemporary China, CEFC, Taipei Office, Associate Professor, University of Paris Diderot, and an Asia-Pacific Journal Associate. Labor conditions for the workers employed to clean up after the accident at the Fukushima Dai-ichi Nuclear Power Plant operated by TEPCO have worsened considerably since the time of the accident; compensation has decreased, the housing situation has worsened, and more.This has been reported in at least three forums: first, on the radio programHôdô suru rajio Radio Broadcast News] broadcast on March 15, 2013, specifically in a segment called “Radio Broadcast News Brings You the True Story of the Two Years since the Nuclear Accident” (hereafter referred to as:Radio Broadcast News); second, a roundtable discussion published in the April 2013 issue of the journalSekaithat featured three workers at the nuclear plant, entitled “What is happening now at 1-F [an abbreviation for “Fukushima Dai-ichi”]?” (hereafter:Roundtable); and third, a report filed in the same issue ofSekaiby Fuse Yûjin titled “1-F Has Not Yet Been Restored” (hereafter:Report).These sources have publicized the issue in some detail, so in what follows, I would like to draw from these sources what I consider to be the main points of concern and my opinions on how to address them. The Asia-Pacific Journal, Vol. 11, Issue 12, March 25, 2013. Two years after the March 11 earthquake and tsunami triggered the planet’s worst’s nuclear disaster since Chernobyl, journalists are still often asked: is the crisis over? One plausible reply might be that it has just begun. While the threat of another catastrophic release of radiation has receded, perhaps for good, the long, complex struggle to safely remove nuclear fuel from the reactor basements of the Fukushima Daiichi plant is still in its early stages. Reactors still seep radiation, although at a rate of 10 million Becquerel per hour for cesium versus about 800 trillion right after the disaster, according to Reuters. The level outside reactor 3 is 1,710 microsieverts an hour, enough to quickly induce radiation sickness. But radiation around the complex has fallen by about 40 percent in the last year, says operator Tokyo Electric Power Co. (TEPCO). Plant manager Takahashi Takeshi has again predicted that safely dismantling the six-reactor facility will take up to 40 years. “Radiation levels at units one, two and three are very high and the cause of that is the fuel that has melted inside the reactors," he said during a rare media tour of the plant on March 6. "Radiation levels within the buildings are all very high, although the level at Unit 4 is lower.” He insisted that the ruined No. 4 reactor building, containing 1,530 highly toxic fuel rods, would withstand another earthquake, despite doomsday predictions by some. the one that struck on March 11, 2011. Reporters were shown a huge steel structure under construction right next to Unit 4. Engineers explained it will eventually be fitted with a giant crane to lift out the spent fuel rods stored in the top of the Unit 4 building. Takahashi said the fuel removal would begin in November. The twisted steel frame of Unit 3, now partially covered with huge gray steel panels, is still visible from the hydrogen explosion that ripped the building apart. Two large unmanned cranes stand next to the unit, clearing up the debris on the top floor, where some 500 spent fuel rods are kept in a pool. Another 6,300 fuel rods are stored in a common pool nearby. Daiichi’s nuclear fuel is kept cool by thousands of gallons of water pumped every day which engineers are struggling to decontaminate. Over 930 water tanks, each holding 1000 tons, have mushroomed at the plant. Engineers said a single tank fills once every two and a half days. A huge structure with lines of Toshiba-designed filtering equipment labors to remove 62 different types of radioactive materials from the water. There is nowhere else for the water to go. compensation could double from its current estimates to 10 trillion yen. Not a single one of the approximately 160,000 nuclear refugees has been fully compensated for the loss of their property, land and income. The Japan Center for Economic Research, a Tokyo-based think tank, has estimated that decontamination costs alone in the Fukushima residential area could balloon to as much as $600 billion. TEPCO was nationalized in 2012 so much of the burden of paying for this will fall on the taxpayer. Outside the plant, in the towns and villages that evacuated in March 2011, life has frozen in time. Police barricades prevent all but authorized people from entering the 20-km contaminated zone. The sea is still too contaminated to fish so hundreds of local fishermen are idle. Parents around Fukushima Prefecture, home to about two million people, face years of worry about the impact of the Daiichi plant’s payload on their children. In this Greenpeace-produced video, the victims of Fukushima express anger and bewilderment at their predicament, and at what the future holds. Dr David McNeill is the Japan correspondent for The Chronicle of Higher Education and writes for The Independent and Irish Times newspapers. He covered the nuclear disaster for all three publications, has been to Fukushima ten times since 11 March 2011, and has written the book Strong in the Rain (with Lucy Birmingham) about the disasters. He is an Asia-Pacific Journal coordinator. It is just over two years since Japan’s quake, tsunami, and nuclear meltdown. It was Japan’s 3rd nuclear catastrophe, at level 7 highest on the scale and on a par with Chernobyl, although, unlike Hiroshima and Nagasaki, it was self-inflicted. The triple event left 20,000 dead, 315,000 refugees, and a devastated swathe of productive farm and fish country and its towns and villages that will take decades, at least, to recover. Today, the Government of Japan tends to refer to the “Great East Japan Earthquake,” preferring to focus on the quake and tsunami rather than the meltdown, as if it were some inexplicable act of god. It talks of its policies for economic revival, reconstruction and crisis management, but little of the nuclear crisis.